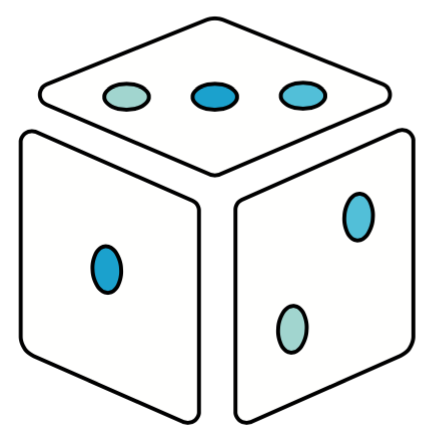 The riskyr data structures essentially describe networks of dependencies. This is best illustrated by the network diagram (see examples of plot_fnet in the user guide and data formats). However, sometimes it is instructive to view all possible values of some parameter as a function of others. A functional perspective illustrates how the value of some parameter (or its values) changes as a function of other parameters (and their values). The basic format of a function is \(y = f(x)\), which illustrates how values of \(y\) depend on values of \(x\) given some function \(f\). riskyr provides 2 functions for viewing parameters as a function of other parameters (and their values). Showing PPV and NPV as a function of prevalence (for a prevalance of 1% and given values of sensitivity and specificity) in the original mammography screening scenario. The curves illustrate that values of PPV and NPV crucially depend on the value of prevalence prev in the current population. In fact, they actually vary across their entire range (i.e., from 0 to 1), rendering any communication of their value utterly meaningless without specifying the current population’s prevalence value prev. 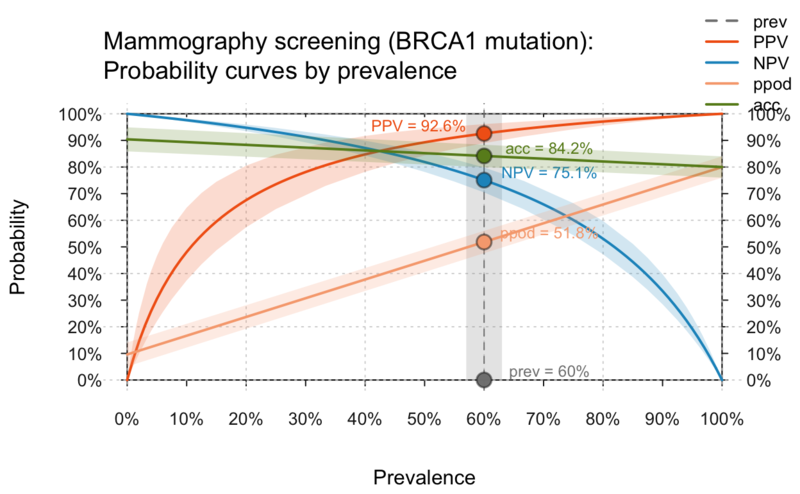 This shows that — given an increased prevalence value prev of 60% — the positive predictive value PPV of a positive test result increases from 7.8% (in the standard population) to around 93% (given the BRCA1 mutation). In addition, the actual values of population and test parameters are often unclear. The plot_curve function reflects this by providing an uncertainty parameter uc that is expressed as a percentage of the specified value. For instance, the following assumes that our parameter values may deviate up to 5% from the specified values and marks the corresponding ranges of uncertainty as shaded areas around the curves that assume exact parameter values. 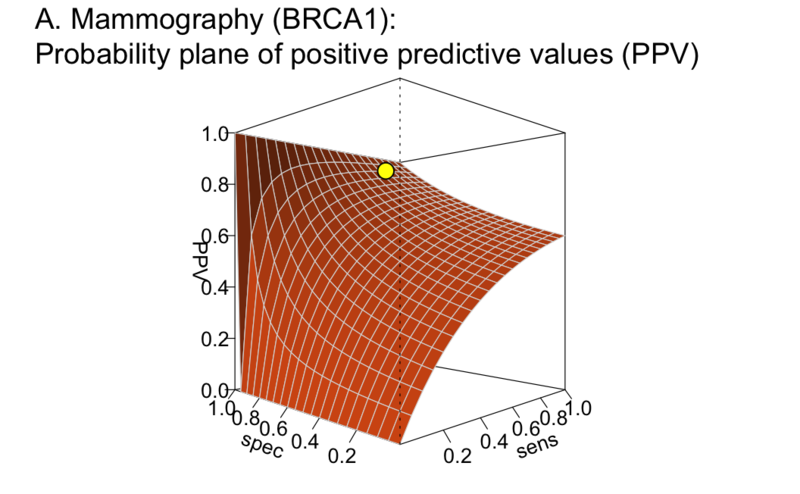 Curves that show PPV/NPV, ppod, and acc as a function of an prevalence (for given values of sensitivity and specificity) when assuming an increased prevalence of 60% and an uncertainty range of 5%. Plane showing the positive predictive value (PPV) as a function of sensitivity and specificity for a given prevalence. Overall, viewing conditional probabilities (like PPV/NPV, but also ppod and acc) as a function of other probabilities (e.g., prev, sens, spec or fart) often provides unexpected relationships and new insights. We appreciate your feedback, comments, or questions. Please report any riskyr-related issues at https://github.com/hneth/riskyr/issues. Contact us at contact.riskyr@gmail.com with any comments, questions, or suggestions.